This is a true story which reaffirms the most sobering part of the wedding vows: "In sickness and in health…'til death do us part." 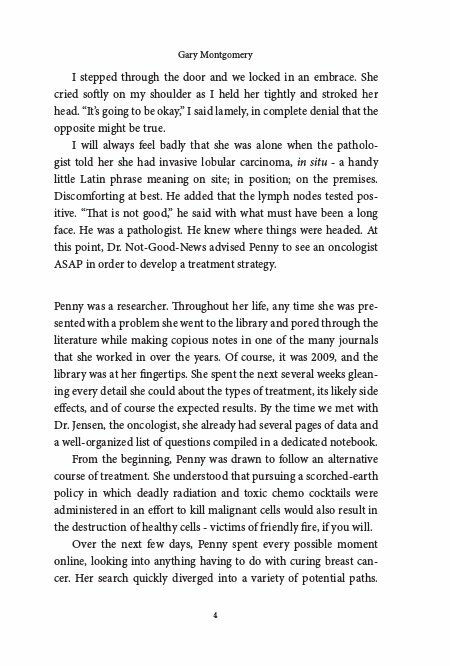 It chronicles, in the words of the author and Penny herself, the discovery of her Stage 3, or possibly even Stage 4 cancer, her reaction to and ultimate rejection of the formal methods of treatment, her search for alternative medicine, and the final acceptance of her pending death. It is a story of the supportive love of a husband, who even though he perhaps didn't agree with her choices, nevertheless gave her the freedom to make the choices. It is a story that documents a hopeful, but eventually futile, trip from Montana to New York City, to chase the possibility of a cure; painful in that trading the clear bracing air of Big Sky Country for the exhaust fumes of NYC became more than either of them could bear. There came a point, when the inevitability of death became apparent, so they returned to familiar surroundings to spend what time was left in the peace and calm of their little farmstead. This couple had a good life – not a lot of money, but enough to add to the basic creature comforts. They were able to travel, take time for a hike in the woods, or enjoy just sitting on their broad porch with a glass of wine as the sun dipped below the mountains. As the inexorable end approached, it would have been easy to rail at the unfairness of it all, but this couple handled it with love, grace, and humility. Anyone facing a similar tragedy in their own life would find this book uplifting, helpful and a testimonial to the power of committed love. 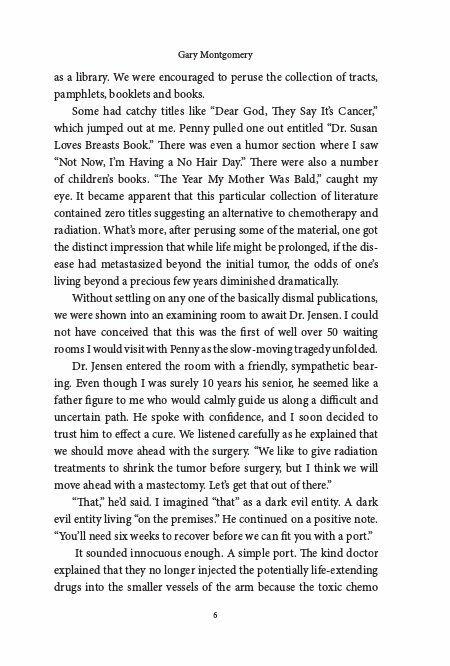 Gary Montgomery details the journey of his wife Penny as she approached her final days on earth. 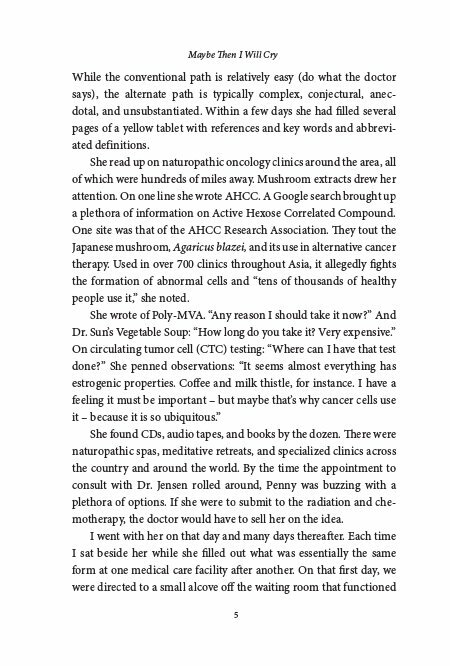 When she was diagnosed with breast cancer, Penny researched the traditional treatments of surgery, chemotherapy and radiation, as well as available alternative methods. She also journaled her ups and downs of dealing with this catastrophic disease and the effects on her life. Gary included sections of her journaling, along with his own thoughts and experiences. Living in rural Montana provided a setting of serenity, juxtaposed with the reality of animals slaying other animals – an intriguing aspect of her journey. 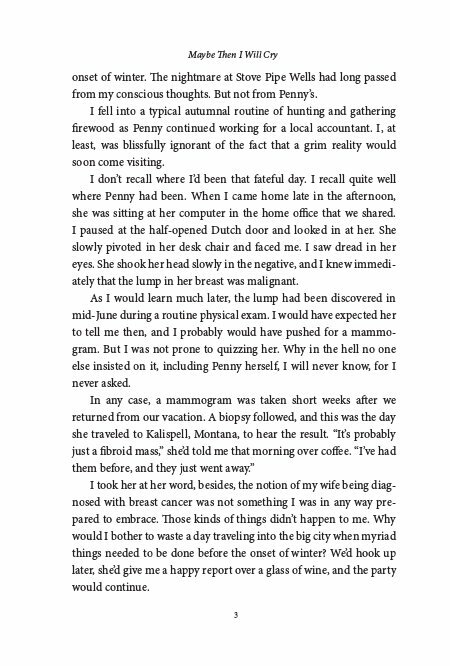 In the memoir Maybe Then I Will Cry, written by Gary Montgomery, a realistic portrayal of a strong woman’s chosen path is presented. This portrayal describes the physical, emotional and spiritual aspects of facing a terminal disease. There is an authenticity to this book, and it is not morose, but hopeful. 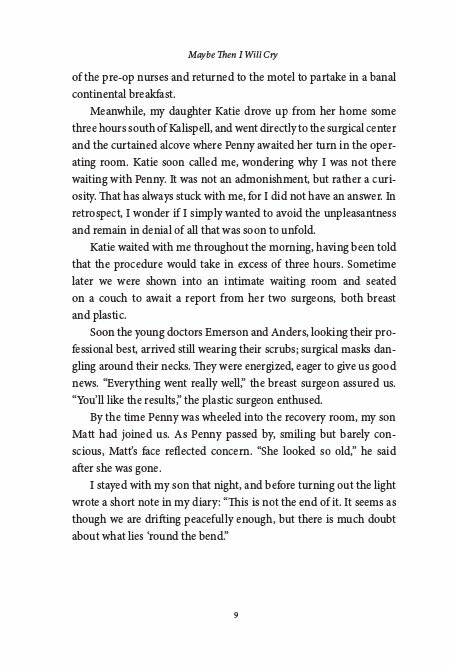 Although Penny struggles with feelings of depression at times, the story also includes the times of joy and peacefulness the couple experiences. Gary never fails to support her decisions, even when he senses the probable futility of them. His writing engages the reader throughout the book. He has woven her journaling with factual information with his own experiences in a seamless way. Their trip to New York City for a miracle cure was poignant, representing a last-chance effort that many people with a cancer diagnosis consider. 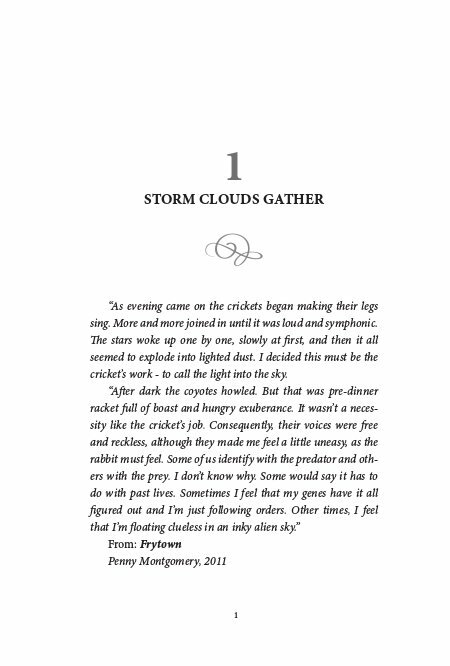 The last chapter was especially touching. 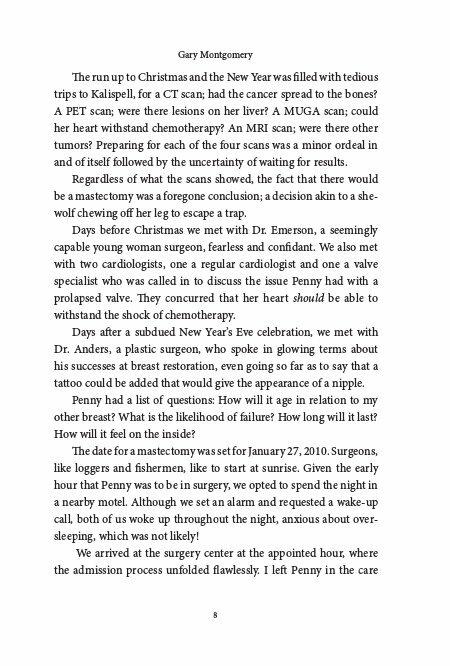 Author Gary Montgomery has written a beautiful testimonial for his beloved Penny in Maybe Then I Will Cry. Gary Montgomery attended elementary school in Pennsylvania, high school in Florida, and college in Colorado, where he earned a bachelor's degree in wildlife biology. Returning to Florida to pursue graduate studies in marine ecology, he became sidetracked as a science teacher and an environmental educator. It was 1973 and young couples were taking seriously the advice to drop out and return to the land. With his wife and two children he set out across the United States in a van pulling a home-built trailer, destination Montana. The plan was to purchase ten acres, build a cabin, eat a lot of peaches and raise their children in a fairy tale lifestyle. Fate required that there would also be plans B, C, D,…and so on. Another child, two marriages, and a host of new jobs unfolded over the years in Montana. Working in the woods provided most of the opportunity in the early years which included logging, both conventional and helicopter; firewood and Christmas tree cutting; U.S. Forest Service fire, thinning and timber crews; and lumber mill work. In the late 1970s Gary managed a cattle and hay ranch, and by the mid-1980s he was operating a small printing and photo processing business. The printing business led him into publishing. Not only did he distribute a weekly flyer for 20 years, but he has published The Trail, a quarterly historical journal for the last 28 years. He and Theodora live on eight acres where they work to weed the garden, gather eggs, feed the sheep, and contain the rabbits. With Teddy's line of hand-crafted herbal products, a vacation rental, and Gary's freelance writing, they thrive in their cozy log cabin with its million-dollar view of the Montana Rockies.